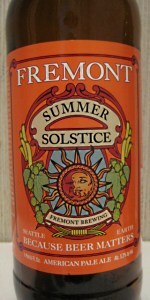 Summer Ale tastes like tangerine flowers in a glass, endless days brewed into nectar of barley and hops. Four-hundred twenty reasons to enjoy this beer. Our answer to bigger is better, Summer Ale is as simple as craft beer gets. One grain, one hop. Simplicity...yet, so much more. From a 12 oz can (packaged May 31, 2016) to a nonic glass. Reviewed from notes dated July 11, 2016. A-The beer pours with a tall, sticky, white head. Retention is OK and the beer leaves some chunks of lace on the glass. It is strangely murky and orange in color. I would prefer more clarity here. S-Fortunately, the beer smells better than it looks. A nice hoppy orange, citrusy bite with a touch of lime is what I first smell. The beer suggests lemon grass with a little bit of doughy pale malt to balance the hops. Snappy and light, like you would expect for a summer beer. T-The taste tracks the smell closely. I taste lemongrass, orange, and white bread crust. It is snappy and sharp instead of bitter or heavy. M-The body is light, crisp, and very drinkable. O-This is another enjoyable Fremont beer. It beer lives up to the advertising as a great "summer ale." It is light, refreshing, and drinks easily without overloading your palate or your gut. It isn't simple, however, and you won't fee like you have wasted your calories or your time having a few of these. Hazy, golden amber. White, foamy head with streak lacing. Aroma is herbal and grassy, with some hints of orange. Flavor is melow, with some citrus & lemongrass coming through in the crisp, clean finish. Yeah, I'll have another. Poured from a bomber into a tumbler on 01.24.14. A: See through gold. 1 finger head. T: Tangerine dominant. Grapefruit, pine, subtle malt. O: This is a tangerine bomb. The first time that I had this, I was surprised by the flavor. It's now a summer staple for me. 12oz can poured into a stange type glass. No date on the can. Beer pours a pale golden color, clear, with a moderate white head. Carbonation like soda. Faint but pleasant floral hop aroma. Taste is similar: delivers a solid dose of IBUs, floral (all Amarillo per the can). Result is fairly citrusy, too. Light on malt and mouthfeel, but moderate-high carbonation lends to a refreshing, easy on a warm night, beer. Nothing complex here, just a high quality execution of a simple style. A - Clear golden color with a medium sized, smooth, soapy, white head. Decent retention leaving a small amount of lace. S - Really nice smelling beer. Simple and clean. Really hoppy with a nice orange and slightly grapefruit aroma. Touches of floral notes. Simple, grainy malt backbone. T - Just like the aroma. Simple, clean, and has a nice hop kick for a Pale Ale. Orange and grapefruit with a nice juicy, fruity hop flavor. Notes of floral hop mixes with a subdued grainy malt. Very fresh tasting. M - Light body with above average carbonation. Clean, crisp, and refreshing. D - Very easy to drink Pale Ale. Very refreshing and all together simple. Plenty of hops (just Amarillo), and very fresh tasting. Notes: Just uses Amarillo hops and 2-row malt which leads to a very simple, clean, refreshing beer. Fresh hop taste with a nice light maltiness. Spot on for a summer beer. a: 2 finger foamy white head on top of a slightly hazy bright apricot...looks great, and good lacing! s: this is very nice use of amarillo...lots of tangerine and grapefruit, juicy and some nice pith and rind, too. A little bit of grassiness, too. t: pale bready malts have a bit more role to play here both at the point of entry and as it lingers...as for the citrus, it is more floral on the tongue...nice rind. m: soft body, medium carbonation, dries out at the end very nicely. nothing terribly complex about this, but it presents a great Amarillo focused package, and I find it really satisfying and enjoyable and refreshing. Clear golden yellow with a foamy white head. Floral, citrusy, lemon hops. Easy drinking and delicious, perfect for some early summer baseball. Surprised by this beer a bit. Poured a murky dull yellow to orange. The nose is of citrus and a bouquet flowers. Taste is very crisp citrus (tangerine and grapefruit) light Mellon and fresh cut flowers. Crisp and dry mouthfeel. Good beer. Pours a cloudy solid pale golden body with a 3/4 inch white head. Some lacing, little retention. Smell of lemon citrus leads to a bread like malt. Scent started out somewhat vibrant but faded quickly. Taste is somewhat hop forward. Leading to a slight malt profile and a bitter dry hop finish and after taste.